My visit to the Springs Preserve in Las Vegas today in the monthly Bank of America Museums on US weekend was cut short as they are hosting a special event Mardi Gras Vegas that features Cajun and Creole cuisine, music and culture from 3:00 p.m. to 7:00 p.m. The access to the Nevada State Museum was not affected. Before I left, I picked up an advertising card for a running event "Run Away with Cirque du Soleil" on March 28, 2015. 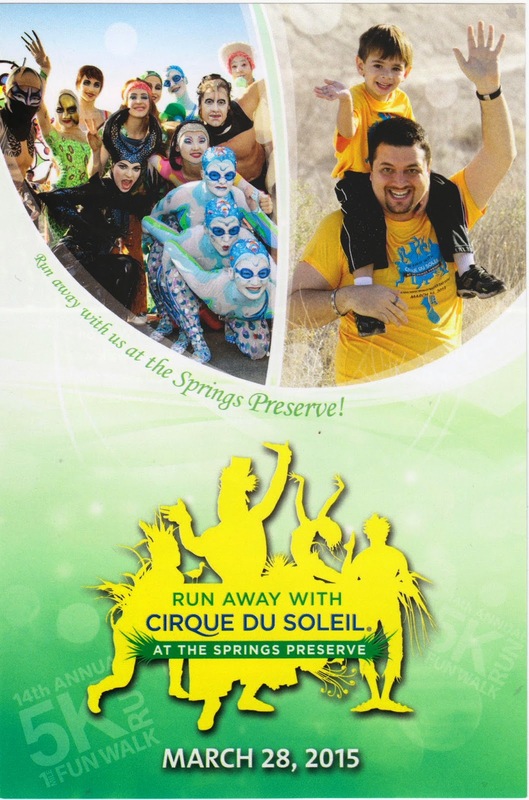 Participants can run 5K or walk 1 mile with Cirque du Soleil cast members on the Springs Preserve ground at this annual event. All proceeds support the educational and environmental-sustainability programs at the Springs Preserve Foundation and Cirque du Soleil Foundation. You can register online at active.com.